If you want bigger arms, you need to train the bigger muscles. Give your arms the extra pump they need by putting your triceps long head through this short workout. You're likely aware that the triceps make up a majority of the bulk in your upper arm. As a major contributor to size, training triceps is lesson number one for building bigger arms. Now it's time for lesson number two: The long head of the triceps is the biggest part of the group and adds bulk to your upper arm. Devoting special attention to the long head of the triceps is the key to adding more mass to your arms. The triceps long head is different from the lateral and medial heads because it crosses the shoulder joint and assists in shoulder extension. To best target the triceps long head, therefore, the shoulder needs to be in a flexed position, as in overhead extensions. Overhead extensions won't completely isolate the long head, but they do place the majority of the load on the long head, leaving the other two heads of the triceps playing supporting roles. Do this quick and effective workout as part of your overall triceps routine, or add it as a secondary workout to your chest or shoulder plan. Just make sure you don't do these exercises at the beginning of your workout. You want your elbows and shoulders already warmed up before you start. To ensure there is an overall balance to your physique and your strength, it's important to make sure each arm works on its own. Therefore, dumbbells are a great choice. It's also a free-weight movement, so your triceps must work even harder to stabilize the weight. With each set, add weight and drop reps, starting with 12 reps on the first set, then 10, then 8. When you perform the overhead extension, lower the weight until you feel a good stretch in your triceps, but avoid going too far, as doing so might cause injury. Press the weight up slowly and squeeze with focus at the top. Flex your triceps hard when the weight is all the way up. Keep your arm and shoulder safe from injury by maintaining a slow, steady pace throughout each set. With this exercise, you're still in an overhead position, but now you're working both arms at the same time. 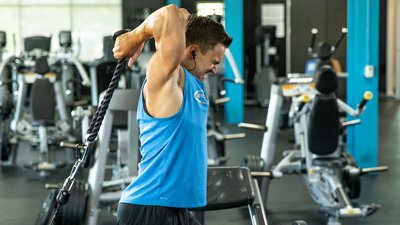 Cables keep tension on your triceps throughout the entire rep while also keeping you in a fixed motion, so you can target that long head. Position the pulley at either the bottom or the top of the stack for this exercise. Just choose the position where you feel your triceps working the most. It's tempting to use some body English on this exercise, but avoid that temptation. If you find yourself using momentum to lift the stack, it means you need to go lighter on the weight. You can't build a muscle if other muscles do the work. Sacrificing your ego by going lighter now will result in greater overall size and confidence later. As with the first exercise, focus on slow, controlled reps. Feel your triceps contract and stretch every time. Since you're using a lighter weight, stick with 3 sets of 15 reps.
Do this short finisher workout a couple times a week, and you should notice big growth in your upper arms.